Mizuno's marketing pitch: Every stride matters. 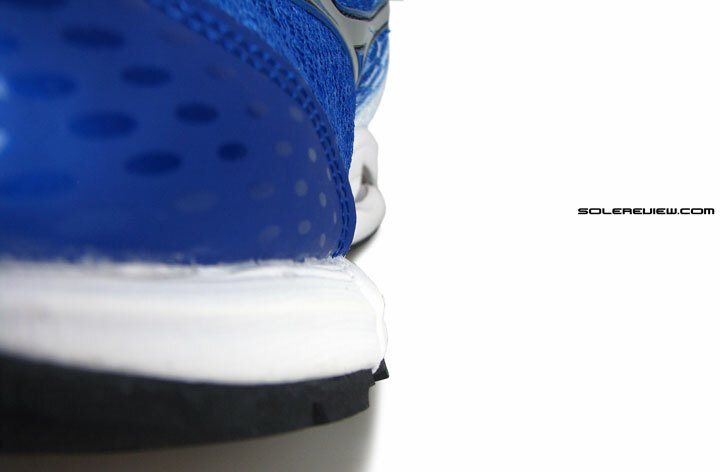 Surfaces tested on: Road, ambient temperature of 26° C/79° F.
Upper: Air mesh, synthetic leather, TPU molding. 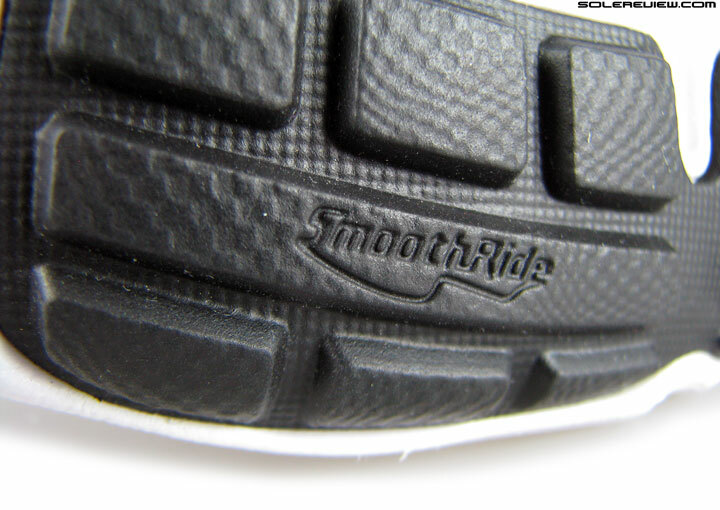 Outsole: Hard carbon rubber under heel, softer rubber under forefoot. Widths available: Standard (reviewed), Wide. 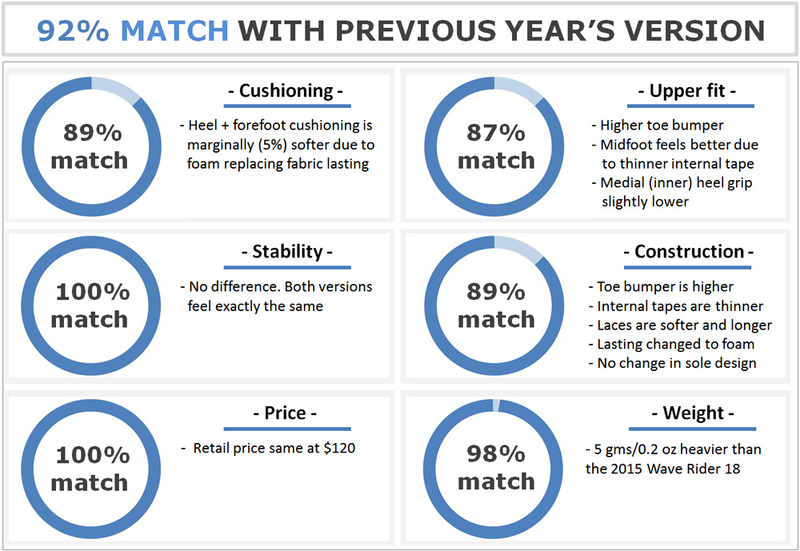 There are three reasons why you should upgrade from the Rider 18 to the 19: forefoot fit, midfoot fit, and the heel fit. 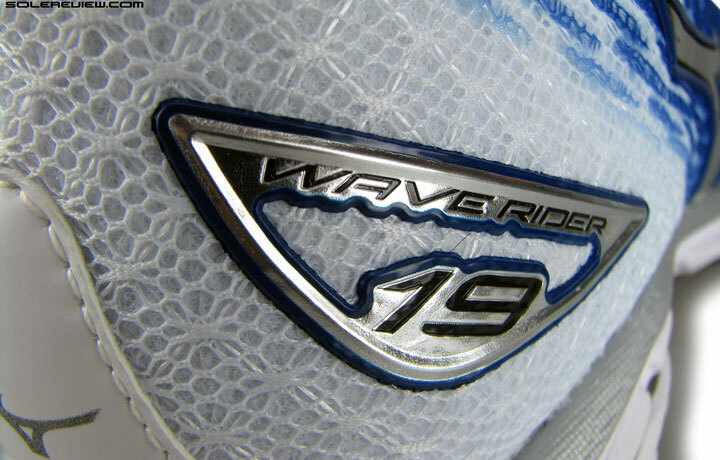 The 19 also retains the firm and somewhat snappy ride of the WR-18, regardless of the new foam lasting. The curious tale of the Wave Rider (pictured) and Wave Inspire. 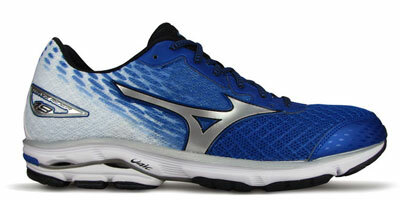 The Wave Rider and Inspire are two of Mizuno’s best selling models. The Rider is categorized as neutral cushioning while the Inspire is a ‘support’ shoe. 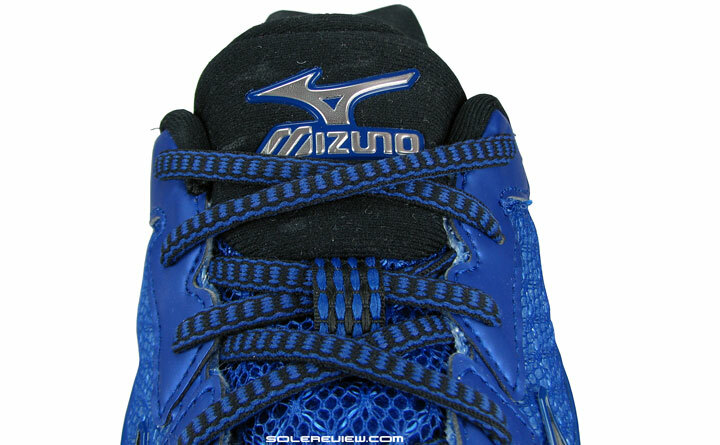 Of course, this is Mizuno we’re talking about, so their support shoe doesn’t mean the same thing as others. The Inspire 12 feels neutral as far as its midsole bias is concerned, meaning that the medial (inner) and lateral (outer) side isn’t clearly demarcated into firm and soft zones. 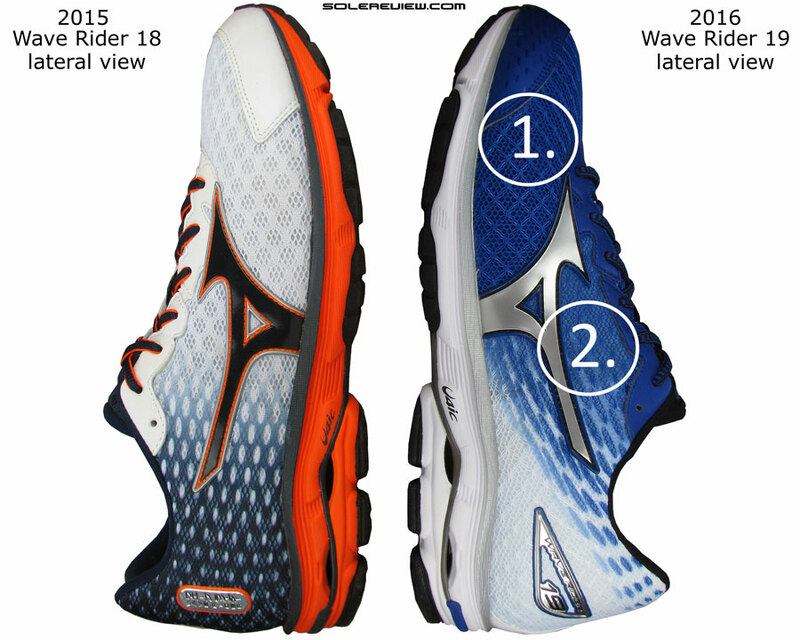 No medial posting business here – instead Mizuno uses a variation of its Wave plate design. The effect is mild to say the least, and you can practically treat the Inspire (and the Paradox too) as neutral shoes. When we reviewed the Inspire 11 and the Rider 18, we found the Inspire to be softer. We were puzzled; after all, isn’t a support shoe supposed to be firmer than its neutral cushioning counterpart if experience is anything to go by? Examples of neutral-support shoe pairings are plentiful. The softer Saucony Ride vs. the firmer Guide, Nike Pegasus vs. the Structure, adidas Glide Boost vs. the Sequence, or the Brooks Glycerin vs. the Adrenaline. We seriously thought that the soft Inspire 11 vs. the firmer Rider 18 was an one-off thing. Like how the 2016 Asics Nimbus 18 feels firmer than the Kayano 22. Except it isn’t. The Inspire 12 continues to retain the soft cushioning quality relative to the Rider 19. And maybe that’s how Mizuno always intended it to be, however unconventional the approach might seem. Which works fine as long as expectations are managed. Mizuno isn’t the most innovative brand around, but is at least fairly consistent with its product approach. They are less prone (there are exceptions, like the Sayonara 3) to seasonal mood swings of cushioning and upper fit, and stay away (mostly) from gimmicks. Ok, maybe the Prophecy is a bit of a stretch, but then hey, the ‘top-tech shoe’ is a game which everyone wants to play. And by the way, the original Prophecy was by no yardstick a bad shoe, which is more than we can say for the likes of adidas Springblade, Nike Air Max and the Asics Quantum 360. The spirit of consistency applies to the Wave Rider update too. The Rider 19 hasn’t evolved much from the Rider 18; if anything, the latest version is a better shoe. There are minor incremental improvements, taking place mostly on the upper. And what of the lower half? There’s a small change there, but not as significant as the ones on the Rider 19 upper. 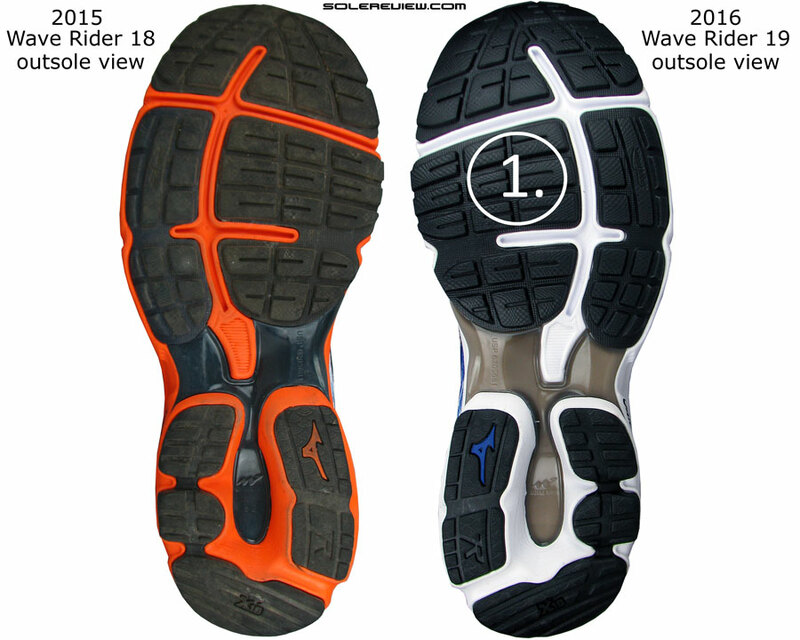 Visually, the Wave Rider 18 and 19 look very similar. The upper follows the standard Mizuno form factor, namely a synthetic leather toe-bumper, a molded Mizuno logo lending structure to the midfoot, and a synthetic lacing area which floats over the nearly all-fabric upper made of air-mesh. Christmas has arrived early for shiny bits. The one you see here over the tongue was not a Rider 18 fixture last year. And the laces? Soft, long and a bit stretchy, replacing the tough ones on the Rider 18. The Wave Rider 19 announces its arrival in style, in a molded metallic shape to be precise. Oh, you poor Runbird. The entire burden of reflectivity is heaped on you. With a size that small, how bright can you be? Not very, sadly. Free standing, wide flap tongue. Same as the Rider 18, then. That, and the lining too. The Rider 19 climbs up a notch or two when it comes to adding small elements of detail. 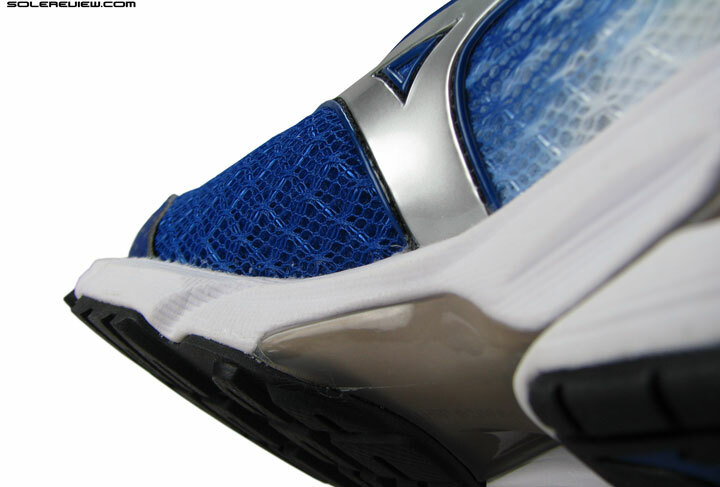 The tongue top for example, has a jewel-like Mizuno logo embossed over it, and the lateral heel calls out the model name by means of metallic urethane molding. Reflectivity wasn’t a highlight on the Rider 18, and is still an ignored aspect on the Rider 19. 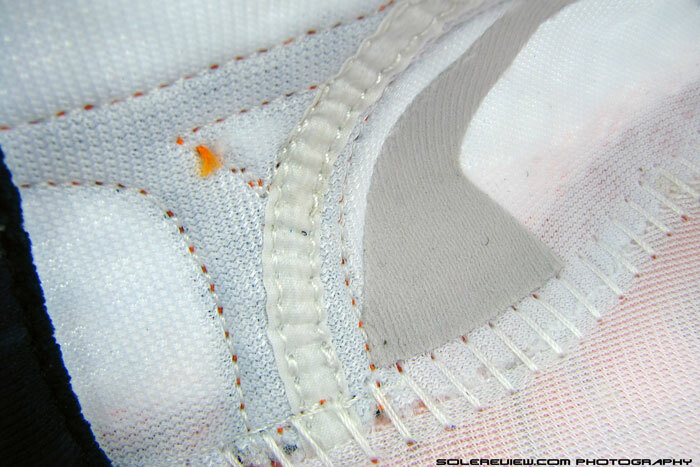 Things like the heel/tongue fabric lining and foam quilting levels are carried over too. Regardless of the Rider 19 being a good likeness of its previous version, there are a few noteworthy updates – mostly inside the upper. The most important of all is the redesigned internal tape around the midfoot area. This was a problem area on the Rider 18 – after all, who in their right minds would put a stitched tape wrapping either sides of the midfoot? Hiding beneath that beautiful facade is an ugly seam. Well, Mizuno did. Not one tape, but three. 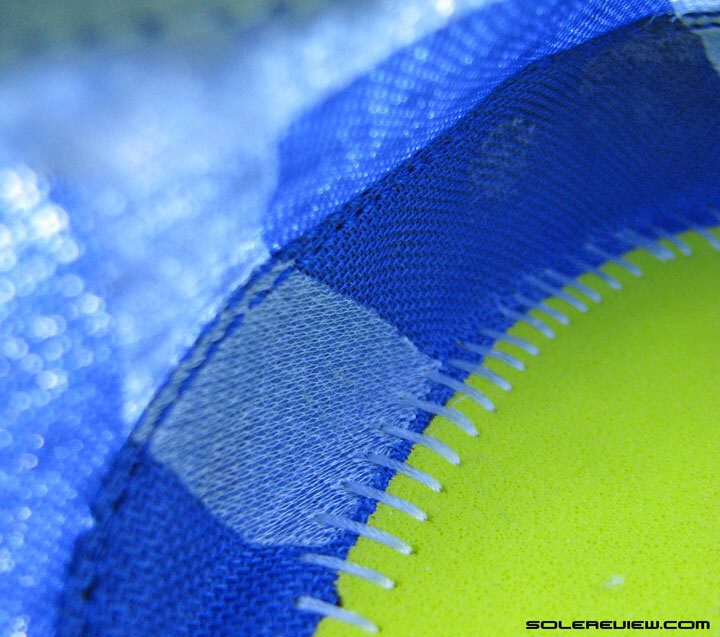 Since the mesh is mostly without supportive layering outside, Mizuno uses two strips to keep the upper from sagging. The third tape is the worst of the lot, since it is a stitched-on tape instead of the glued-on type used in the other two locations. 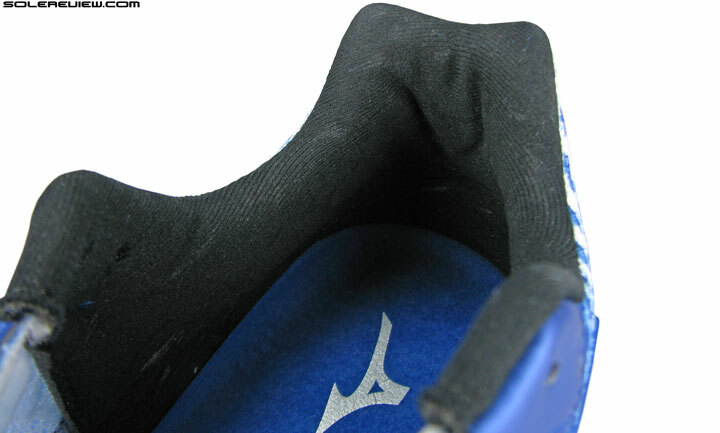 This tape is right under the molded Mizuno logo, and covers the seam which makes the two-piece mesh upper appear as one. This tape was felt rubbing against the arch area on the 2015 Rider 18, and was simply unbearable if you ran in the Rider 18 without socks. Though you still can’t run in the Rider 19 sock-less, the overall situation with respect to the tapes has improved. There are a couple of reasons why the Rider 19 does it better than last year. The thickness of the first two tapes – the ones which lines the forefoot and early midfoot – has been drastically reduced when compared to the Rider 18. The latter used a thick fabric fused to the inside, and that changes to an extremely thin layer which is now flush with the mesh. Support tape #1: On either sides of the forefoot. Not noticeable, because it is of a very thin kind, sitting flush with the upper. Tape #2 followed by the dreaded stitched seam tape #3. The tape #2 is much better than last year, though. And the tape#3 extends further back, reducing arch rub. And while the annoying stitched-on tape is still there on the Rider 19, you don’t feel it as much as you did on the WR-18. The reason? Though the tape begins at a position which is same as the 18, it now has a swooping curve, ending a bit backwards towards the heel. We know it is hard to visualize this, so just know that the midfoot does not have the tight band-like feel from the WR-18. We’ve been seeing a lot of this across brands lately. And what’s that? A higher toe-box. Rider 18 (left) has a sloped front versus the raised profile of the Rider 19 (right). The toe-bumper area is redesigned with a couple of tweaks. First, there’s a vertical height increase which means more space above the toes. There was a slight hint of shallowness on the Rider 18, and that disappears on the 19. Plenty of room above, ahead and around the toes. 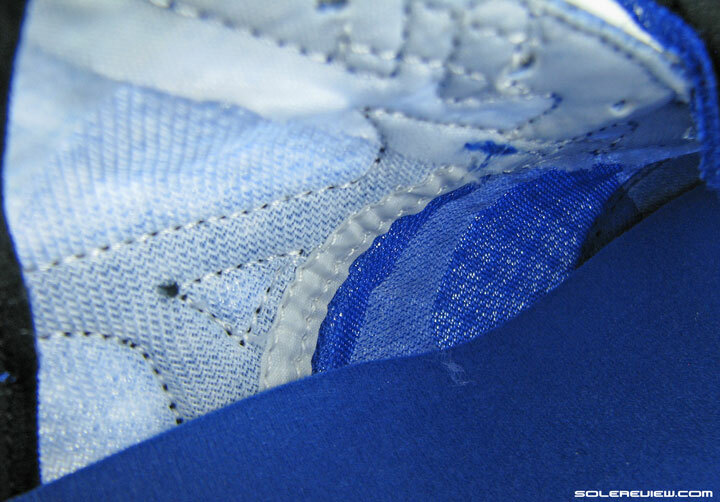 The upper forefoot area also comes with one more change, something which isn’t easily obvious on the surface. This you can’t see from the outside – there’s a tape under the mesh. This is an addition to the Rider 19, and is meant to strengthen the forefoot area. 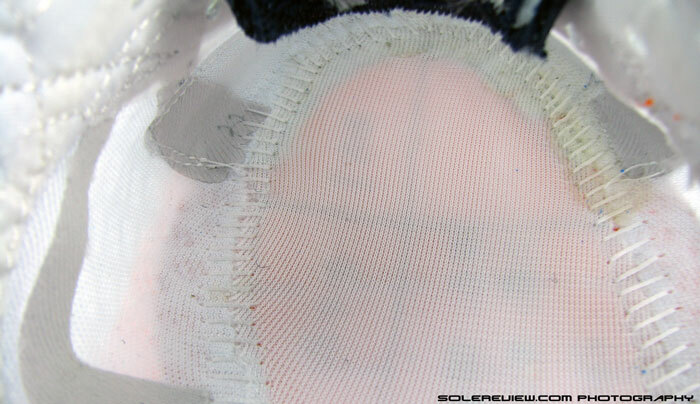 Right under the forefoot mesh, there’s a thin reinforcement tape which wasn’t present on the Rider 18. And what could possibly be the purpose of this material? There were stray reports of the Rider 18’s forefoot mesh’s questionable durability, and this helps strengthen that section. Decent quick-fix, if that was the case. Another invisible change takes place inside the heel. Both the Rider 18 and 19 use a hard heel counter sandwiched between the mesh upper and lining. Only this time, the size of the hard stiffener shrinks in comparison to last year’s model. 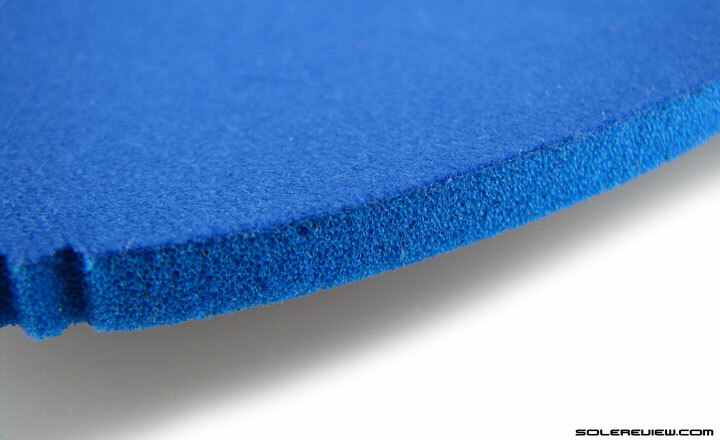 It is lower, meaning that there a larger margin of soft mesh and foam above it. This makes the entire upper heel softer, which includes the Achilles dip too. If that wasn’t enough, the medial (inner) side of the upper heel swoops a bit lower than the WR-18. The Rider 19 uses the same collar mesh and foam, yet feels softer around the edges due to a smaller heel counter inside. 1) Higher and reinforced toe-box 2) Softer and longer laces 3) Lowered heel counter, and softer upper heel. The heel grip isn’t negatively affected – at least not to extent you’d notice. Just that there’s this sense of general increase in softness surrounding the ankles. 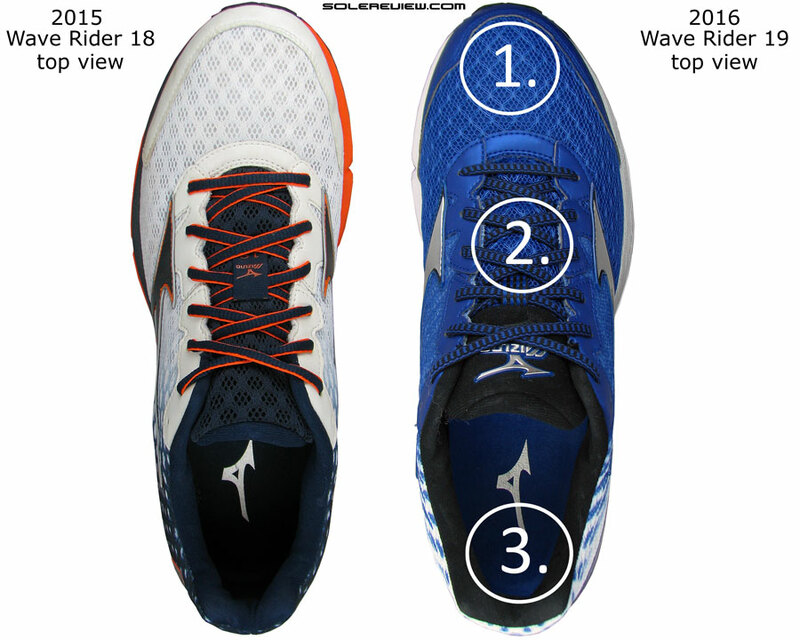 If you look at the overall picture, the Wave Rider 19’s upper fit is decidedly an improvement. The revised taping alone counts for a lot, making the Rider 19 a much nicer place to slide your foot into. The Rider 19’s arch fit feels much better than the Rider 18. 1) Forefoot fit feels smoother due to the updated taping material 2) Midfoot fit has improved due to the revised tape placement. The midfoot fits and feels much smoother due to the change in tape material and position, and the forefoot feels better too. And before we forget, the new laces are worth highlighting. 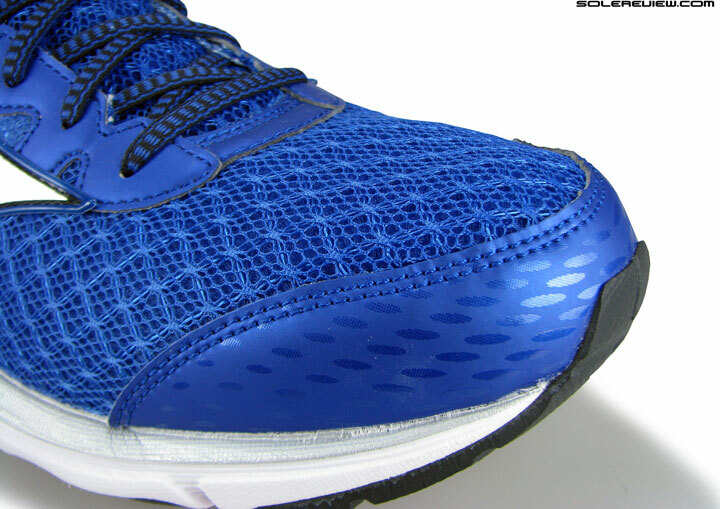 The Rider 19 uses much softer laces, which also happens to be mildly stretchable. Elasticity also translates into extra length, which the new laces happens to have. That’s the only downside of these nice laces, which tend to slap around the sides because of their increased length. 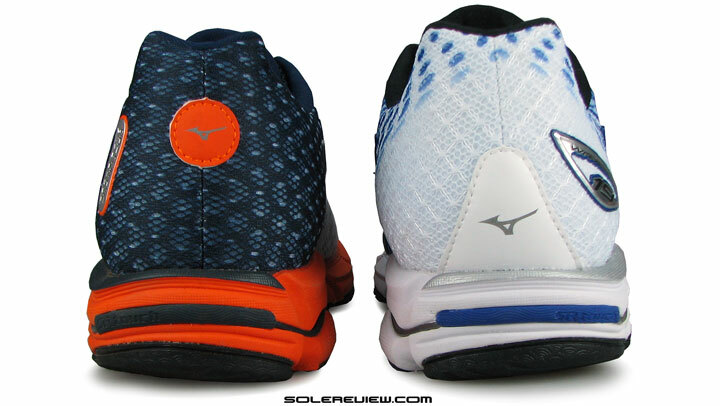 Mizuno claims there is a new sockliner, but it felt the same as the ones inside the Rider 18. Mizuno insoles are the best of the bunch anyway. Plush top-cloth, and a blown foam base. Mizuno mentions the use of an ‘upgraded premium sockliner’, but there’s no difference between it and the one before – at least not something you can feel. 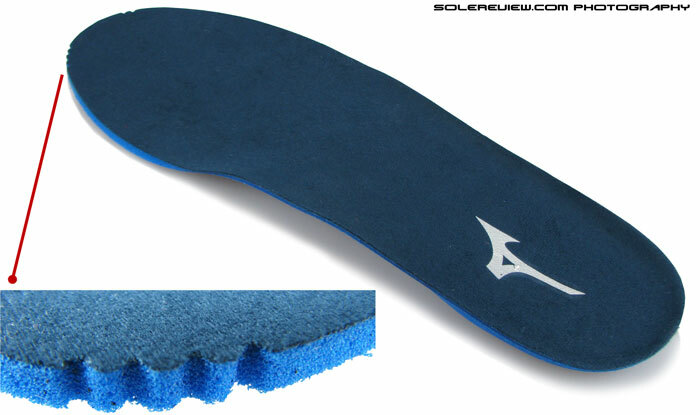 Both insoles use a blown foam base topped off with a fabric which was plush to begin with anyway, even on the Rider 18. 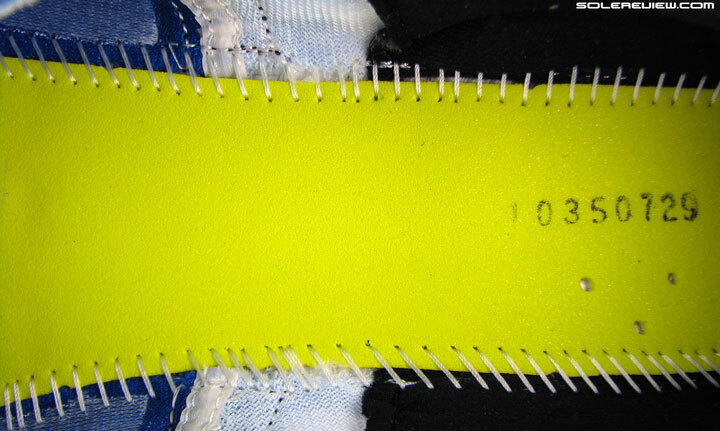 There’s now a foam lasting under the Rider 19 insole. Why should this be pointed out? Because there was a fabric one on the Rider 18 instead of foam. 1) New mold, but the same outsole design carries over from the WR-18. 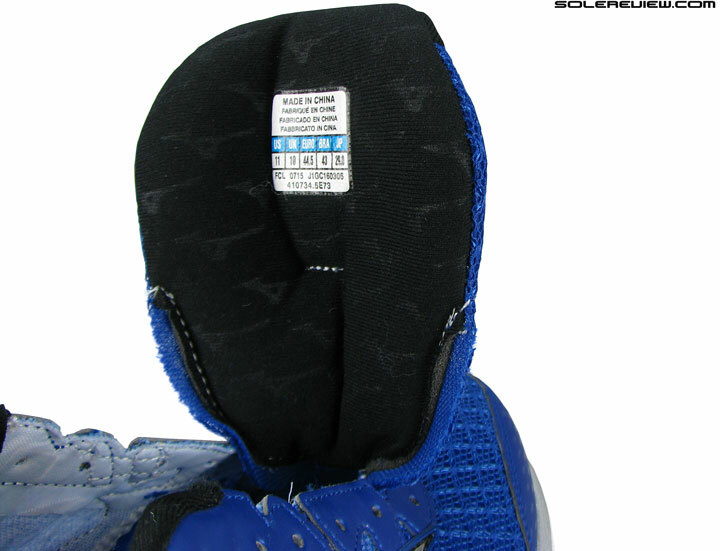 The only midsole update is visible as soon as you lift the removable insole. The Rider 18 used a thin textile based lasting beneath, and that trades places with a foam sheet this year. 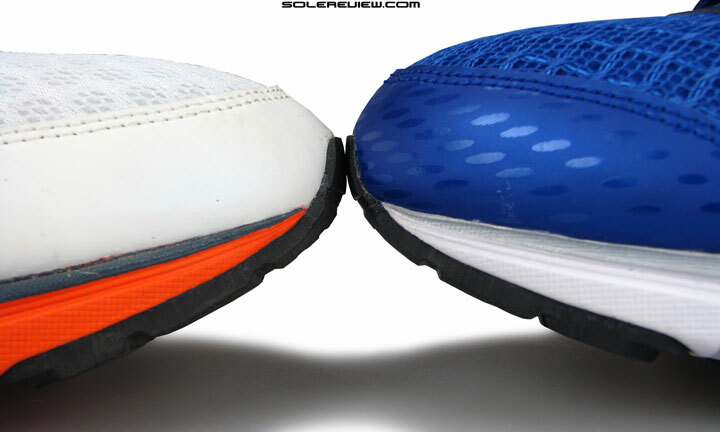 The rest of the midsole is identical to the Rider 18, and so is the rubber outsole below. We did notice the Rider 19 using a slightly different sole mold design, but that is a common practice in the industry. New molds are used on an existing design to boost production capacity, or replace ageing molds. No biggie, happens all the time. Upon seeing the revised foam lasting, we expected the Rider 19 to ride much softer than the 18. But it does not; there is only a very minor bump-up in cushioning, making it nearly identical to the WR-18 as far as the ride is concerned. The foam lasting isn’t exactly soft like Asics, and the midsole design+firmness stay the same. And those of you who haven’t had the opportunity to run in the Rider 18 for reference sake, what does the 19 feel like as a running shoe? This is what gives all Mizuno shoes their characteristic pep. 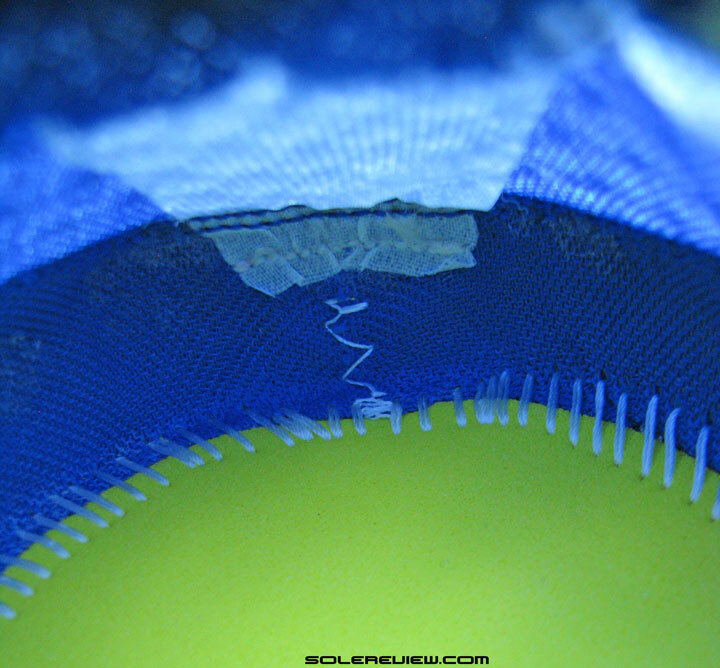 A plastic component inserted between midsole foam layers. 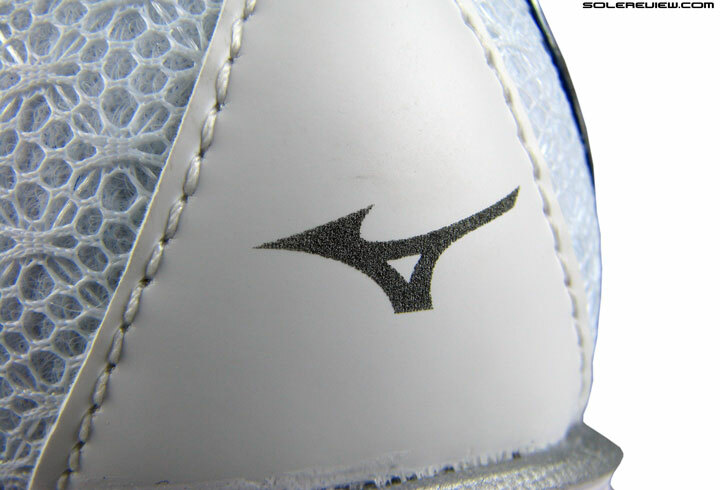 It’s got the now-all-too-familiar Mizuno feel, which is the result of the firm Wave plate embedded in the midsole. 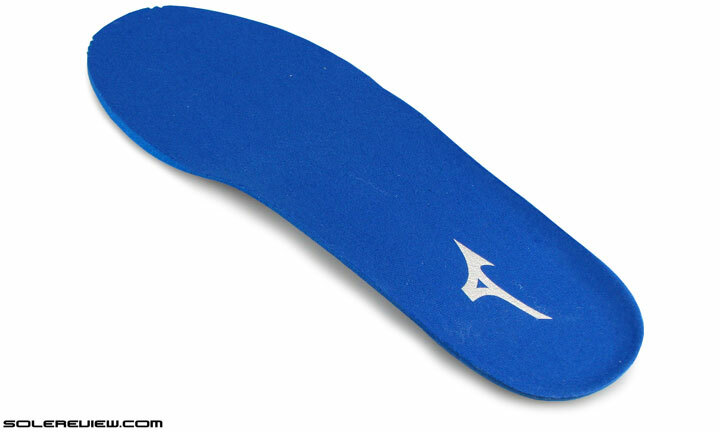 The plastic insert has a gentle ‘wave’ curve under the heel which compresses upon weight loading, delivering the Mizuno ride quality which borders on responsiveness. The lateral and medial side Wave is designed differently, with a pointy Wave pattern acting as a support structure on the inner side. The Inspire 12 does something similar, except that the medial side pointy-ness is more pronounced. The Rider 19 does a better job at isolating the Wave sensation compared to the Inspire. That’s because the Rider has a firm midsole, which helps the Wave plate compress before the foam does, as opposed to the softer Inspire 12, where the softer foam did most of the heavy hitting. One could say that the Inspire 12 has softer cushioning, while the Rider 19 is more responsive while maintaining a firm and stable ride. 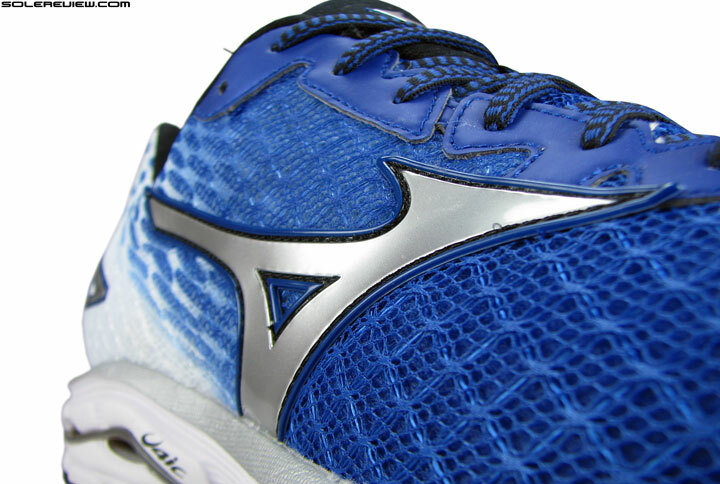 This is a regular Mizuno thing – a flared forefoot design. You’re viewing the shoe front to rear, in case you’re wondering what this picture is about. The Rider feels reasonably fast to run in owing to its respectable weight (305 gm/10.7 oz) and firm ride. There’s little sense of lost efficiency, as the firm and stable base makes transitions quick without see-sawing. Thanks to the same midsole design, the Rider 19 retains the wide forefoot flare and a firm heel which prevents any bias. How about ground feel? The Rider 19 does well there too. That said, the Rider 19 is easily the firmest shoe in its class. So if you haven’t worn a Mizuno before, you will find its firm and somewhat noisy (hard rubber heel, duh) ride puzzling, given the fact that it is supposed to compete with models such as the adidas Glide Boost, Asics Cumulus, Brooks Ghost, Nike Pegasus and Saucony Ride. Yeah, running shoes can be confusing. So this isn’t your regular neutral running shoe, and it certainly does not have the soft padding which one expects from an adidas, Brooks or Nike. If you’re used to a Mizuno, then no problem running long. Else you will be left wanting for a cushioned ride, which the Wave Rider 18 isn’t the right shoe to deliver. The huge plastic Wave plate and firm EVA foam sees to that. Efficient transitions take place on the Rider 19, there’s no denying that. The softer forefoot rubber does make the front feel smoother. The differentiation in ride character makes the Mizuno a good shoe to have as part of your rotation, especially when you need a change from the bouncy cushioning of many foam types and air bags. And on days when one has to run on the much despised treadmill (travel, bad weather, whatever), a Mizuno is your best bet. And rest assured, the Rider 19 is pretty much distraction free. You don’t have to worry about a softer lateral side, mushy forefoot, or any other quirky trait which is increasingly becoming commonplace in running shoes nowadays. On most days, that’s exactly what you need. Nothing more, nothing less. 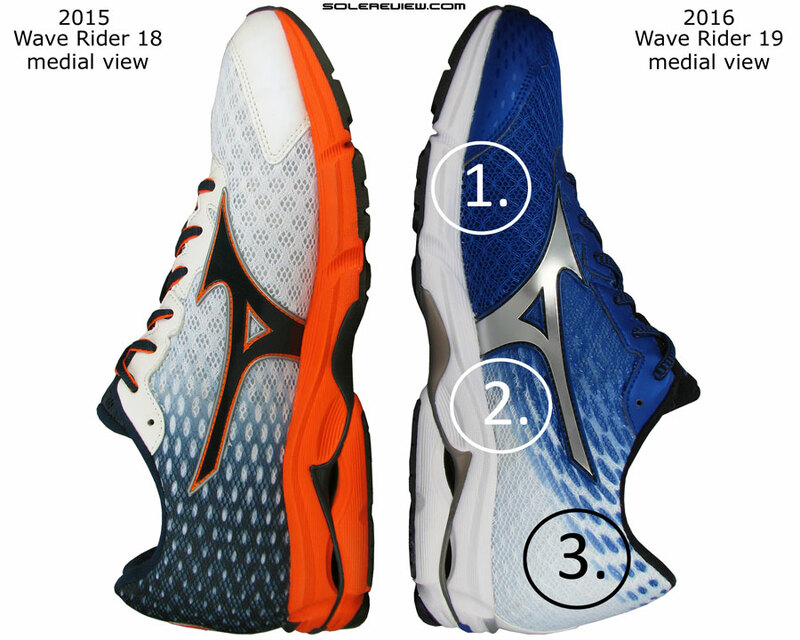 Looking to upgrade to the latest version, but not sure of the differences between a Mizuno Wave Rider 18 and the Wave Rider 19? We can help here. The following infographic is a ready-reckoner for what changes you might expect in the new model vs. old. To make this more fun, we’ve put in a system of percentage match, which calculates a weighted average for a set of attributes.